While VynEL™ by nature is splash resistant, it is not meant for submersion. 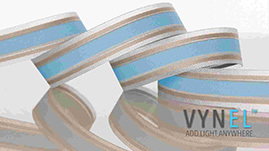 Because of this, we introduce our newest VynEL iteration, VynEL™ Splash Waterproof Strip Light. While VynEL™ by nature is water resistant, it is not meant for submersion. Because of this, we introduce our newest iteration, VynEL™ Splash Waterproof Strip Light. This product is a one of a kind, flexible lighting strip meant for use in marine applications, like boats, search and rescue, wetsuits, life jackets, ponds and more. Now the sky is truly the limit with this fully encapsulated lighting strip. VynEL™ is a new form of Electroluminescence, which has additional properties compared to older EL technologies like EL Tape, Panels, or Wire. 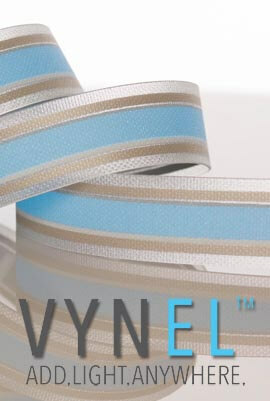 VynEL™ is extremely flexible, which makes it take the shape of any number of products. Why Use VynEL™ SPLASH over a regular EL Panel? VynEL™ SPLASH Lighting Strips give you the ability to integrate lighting into countless applications; water sports, water safety, rescue, and more.